Budget carrier Tigerair yesterday announced three new agreements with other airlines in a move to expand its network in key Asian markets such as India. The low-cost carrier will partner China Airlines to establish a new Taiwan-based budget carrier named Tigerair Taiwan. It has also signed a three-year deal with Indian budget carrier SpiceJet, which will allow passengers to travel between 14 Indian cities and Singapore via Hyderabad from next month. They include Bhopal, Mumbai, Kolkata, Delhi, Goa, Mangalore and Tirupati. The interline arrangement will allow passengers connecting to flights on either of the airlines to transfer without having to check in their luggage again. Tigerair also plans to better align its flights with budget carrier Scoot to offer local travellers more flexibility and flight options. Said Tigerair Group chief executive Koay Peng Yen: "These alliances will enable us to tap on the strengths of our strategic partners and extend our presence into existing and new markets without taxing our balance sheet." The partnerships will mean greater travel options for Tigerair customers, he said. Tigerair will own a 10 per cent stake in Tigerair Taiwan, which will have a paid-up capital of about NT$2 billion (S$84.7 million). 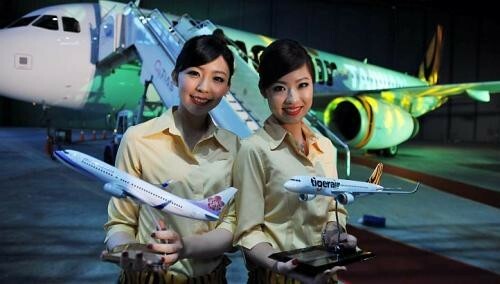 Tigerair Taiwan will be operational by the fourth quarter of next year with an initial three aircraft. The joint venture will operate under the Tigerair brand and use its website as its main sales platform. It will be run by a separate board and management team. Mr Koay said the new budget airline is expected to target China, Korea, Japan and South-east Asia. He added that the airline will start using Tigerair's Airbus A-320 jets and grow its fleet to 12 aircraft in two to three years. Tigerair's 10 per cent stake in the venture was an "appropriate" number agreed on by both airlines, though this could rise in the long term, he said. Tigerair can own a maximum stake of 49 per cent in the joint venture. Analyst Brendan Sobie from the Centre for Asia Pacific Aviation said the new airline gives Tigerair another outlet for expansion from Taiwan, which is under- used by low-cost carriers. He said Tigerair's low stake is "slightly unusual" for the low-cost model, in which affiliates generally have stakes between 30 per cent and 49 per cent. Mr Sobie noted that while the low stake means low risk, "if there are future disagreements, having 10 per cent doesn't give much say at the board level". Tigerair and Scoot will submit an application to the Competition Commission of Singapore for anti-trust immunity after agreeing to expand on their alliance. If approved, the airlines could jointly operate and sell parallel routes, as well as align policies and pricing. Said Scoot chief executive Campbell Wilson: "Our interline cooperation over the past year has revealed strong demand for joint itineraries from customers outside Singapore and it's clear there is similar demand from Singaporeans for greater alignment." Separately, Scoot - the fully owned budget offshoot of Singapore Airlines - also announced that it would form a new low-cost airline with Thai carrier Nok Air. The new airline will be named NokScoot and be based at Don Muang International Airport in Bangkok. It will operate wide-body aircraft on medium- and long-haul international routes and have an initial investment of 2 billion baht (S$78.3 million). Details about its fleet, products and route network will be announced later.